Hailing from Dublin, Ireland Lorcan Jude Devaney has quickly made a name for himself as an artist who thinks outside of the box when it comes to makeup. 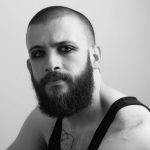 Lorcan’s start in makeup came from an obsession with shape and color and led to him working on music videos and stage makeup for live shows for some of the biggest Irish musicians including Le Galaxie, Glen Hansard and BARQ. He has kept this theme in his work in the US collaborating with artists such as Joan Jett, Phil Gibbs and the dAvid strAnge. His makeup is a focus on striking visual impact and creating an iconic signature look for clients. As a result of this, his work has been seen by thousands on the stages of festivals and venues across two continents.